On Tuesday, December 13, 1938, five women met at the home of Mrs. T. K. (Irma) Shepherd to discuss organizing some sort of club through which closer social contacts could be made and civic and cultural status might be improved. It was agreed that a meeting would be held on the second Tuesday in January and elect officers. Meanwhile, each one should invite someone else to join and make plans for the work of the club. On April 11, 1939, a meeting was held with seventeen present and officers were elected. Since then the Club has held monthly meetings and now has its specified quota of one hundred members, plus associates and life members. Jefferson Parish and particularly the east bank. “Think, Resolve, Act”, presented by Bertie Zuber, remains effective today. In the past 75 years, Metairie Woman’s Club spearheaded projects for the betterment of Jefferson Parish. Working with Congressman Hale Boggs they insisted on bigger and higher levees along Lake Pontchartrain; they were the driving force behind an advisory board to build a center for the Performing Arts; they organized a hospital auxiliary before the completion of East Jefferson Hospital and presented para-medical program in East Jefferson high schools and conducted tours in the New Orleans area hospitals in connection with a recruitment program for future hospital and health careers. 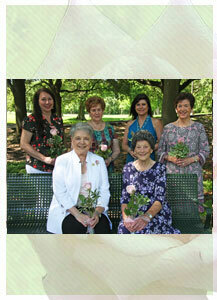 More than three-fourths of the presidents of the hospital auxiliary have been members of Metairie Woman’s Club. Once the hospital was built the Club petitioned the Parish to build sidewalks from Veterans Boulevard to the hospital and to build a bridge over the Canal at Houma Boulevard making for easier access to the hospital. They protested the operation of pornographic book stores causing Sheriff Al Cronvich to raid and shut down the operations. The Club petitioned the School Board for a school for the deaf and it was subsequently named “The Hilda Knoff School for the Deaf” after a Club member. Shortly after the attack on Pearl Harbor in December, 1941, the club, with a membership of 30 active and 5 sustaining members, undertook chairmanship of the War Bond Drive in Metairie. The club’s headquarters for the sale of war bonds was located at the Louisiana Power and Light Company on Metairie Road. More than $20,000.00 of bonds were sold from their booth in the LP&L building. For distinguished services rendered in behalf of the War Savings’ Program a citatation certificate was awarded to Metairie Woman’s Club by the United States Treasury Department. In 1944, the club again sold $15,175.00 in “E” bonds and $15,000.00 in “C” bonds as its part of the War effort. During World War II all of the members joined the American Red Cross and did their share in the war effort. Through one of their earliest fundraising efforts, they purchased two stretchers for the Civilian Defense Ambulance Corporation. They furnished and decorated a room at the Recreation Center at the Harahan Port of Embarkation and purchased a piano for La Garde Hospital and another for the Tumor Ward of Charity Hospital. In keeping with their first mission, when the Jefferson Parish Library, Metairie Branch was established in 1949, the Club donated its first complete set of encyclopedia and hundreds of reference and other library books have been given through the years. The Jefferson Parish Recreation Department’s Metairie Playground was the recipient of three water fountains, an electric scoreboard in the gymnasium, a completely equipped ceramic room, two air-conditioning units, a storage room, a kitchen refrigerator-freezer, eight foot tables, draperies and a flagpole. The Club supported wholeheartedly the building of Lafreniere Park and gave monies for the establishment of a Parterre Garden. More recently they donated a Park bench in memory of Sheriff Harry Lee. The women have sponsored trips for high school marching bands and journalism clubs and in the health field have been movers and shakers for the Leukemia Drive, Cystic Fibrosis, Diabetes Association summer camp program, St. Elizabeth’s Home for Girls, the New Orleans Blood Bank and Cancer Research. In their civic endeavors they have protested the sale of East Jefferson Hospital and the actions of the Parish President to pay high salaries to appointed personnel. Letters to the East Bank Guide , The Jefferson Parish Times ,The Times Picayune and the States- Item newspapers have boldly stated the Club’s views on hundreds of matters that were either for the good or the detriment of the citizens. The members of Metairie Woman’s Club, through their history, have shown their caring for the needy, the downtrodden, the “special” children and adults, and for the moral and civic problems in the community. They have committed themselves to their goals and have been and are truly the movers and shakers of Metairie. as part of the Louisiana Research Collection.